"With Carnyx coming to Tranquility it will no longer be possible to launch EVE Online using the exefile.exe file from EVE/bin/ folder. If you are using this method due to the issue with your launcher where 'PLAY' button remains gray after downloading an update, please pay close attention to the information provided in this article." Two-factor authentication fully in place? Yay! But less than two hours later, CCP published a retraction. "If you have previously been using the Repair Tool to update your EVE Online client, attempting to use it to update your client after the Carnyx release may fail. "If this is the case, you will be required to use the launcher to update your client. If you are unable to use the launcher due to an error, please try reinstalling the launcher using the instructions in this support article. "If you continue to experience issues with attempting to update your EVE Online client, please contact Customer Support and file a ticket under Technical Support -> Installation and Patching. "Please note that contrary to the earlier news article, launching the EVE Online client using exefile.exe will continue to work after the deployment of the Carnyx release." Fortunately I didn't finish the original post on the topic on how CCP had finally fully implemented two-factor authentication and how many players would shout from the mountaintops that using the launcher is evil. I guess that's a post for a future date. "Many of you wonder, why we have said, that Arena will no longer will be available. "Actually, since the beginning of Honorbuddy, Arena was the only section of the game where we actually never wanted our bot to be. There where many requests in the forums and we always declined them. We did not want to automate Arena. The main reason for this was, that this is the only thing in WOW that had the one-on-one spirit of competition. And we wanted to leave it that way. The decision came from above, from Bossland and from Hawker. "If you search harder you will most likely find many such posts. "Why the recent change then? Again it is not a change, it is something we decided long ago but did not enforce. "We are now just making sure it stays the way it was supposed to be since 2010. That said, we are also looking into Battlegrounds. "We approved Honorbuddy to be used in Battlegrounds since its first release but we will look into that again and tell you if we have a change of mind very soon. Or maybe, just maybe Blizzard opens the "Bottlegrounds" with patch 6.2., exclusively for us paying customers. "I am also very sorry about the censorship that took place in this forum, i have reopened most of the threads. You are always free to discuss relevant matters in our forums." HonorBuddy, as used in WoW's arenas, isn't a bot in the true sense of the word. What HonorBuddy did in arenas is provide a feature called combat rotations (CR), which pushes the keys for HonorBuddy users more effectively than the users themselves. In EVE Online, what HonorBuddy does is considered a macro. But since WoW has a macro system in place, players tend to call everything a bot. Perhaps "automated cheating" is a better term. "Yes for now. It is not sustainable to have BGs with too many of the players being bots and we are reviewing how to handle this. I am hoping that removing BGBuddy from trial keys will remove the users who buy a trial and bot continuously for 72 hours and get their full epic set." "I get it you guys are looking for a PVP program with the recent banning of HB and them closing their doors if not temporarily or forever. I do not develop, or support development on anything thats intent is to directly impacts the gameplay of other players. I am not sure what about the HB ban has all the sudden made everyone a 'Warden Expert', but I do things a certain way here for a reason, and it has worked quite well so far. "Its not just about having protection, its about not ruffling too many feathers. Like I said I get that you guys want something for PVP, I am sure someone will eventually fill that demand but for the safety and longevity of my product, it will not be me. It is nothing that I can be convinced otherwise either, there are more than enough people that prefer PVE rotations and I certainly enjoy focusing my time and effort into that crowds wants, instead of one that would just contribute to more problems in the botting community." One of my favorite sayings is that people hate losing to software. In a PvP environment, players don't mind losing (much) to players with more skill. But losing to players with less skill using a cheat, especially one clearly against the rules? Then players start complaining. Loudly. For these two developers, the obvious answer is to restrict, if not prohibit, the use of their products in PvP. Hopefully, a pullback by Bossland away from PvP will not reduce Blizzard's efforts at stopping botting in PvE. If my monitoring of the gold selling sites is any indication, the illicit RMT operations took a hit as the supply of gold available to sell fell after the ban wave two weeks ago. Bossland's retreat from PvP is a sign of Blizzard's effectiveness. I really hope Blizzard keeps up the pressure. An interesting event occurred last week. Both TheMittani.com and Eve News 24 put out a call for new writers. Anyone wanting to get into writing about EVE now has the chance to make a little in-game ISK, or even potentially real world cash. – Decent EVE politics knowledge. – Decent EVE Online experience. – Wish to earn some Iskies. – Opportunity to interview well-known players. Note: In-game background is not important for the job, everybody is welcome! EN24 is easy to understand. The site focuses strictly on EVE. For those who wish to write a lot, a pretty good opportunity. Email a writing sample in the form of a publishable feature article to submissions@themittani.com. If your application is accepted, this will be your first published piece. It should relate to something our readers are interested in - our core games (Eve Online, Star Citizen, H1Z1, Elite: Dangerous, League of Legends, Mechwarrior Online, PlanetSide 2, World of Tanks, World of Warships), science fiction book reviews, or real world space/future tech news. Former contributors interested in returning under this new system are welcome to apply normally. Contributors are expected to write a minimum of one publishable article every two weeks. Contributors who write relevant articles will be gifted 250m ISK per published article. Each month, the three contributors who have produced the most relevant articles will be gifted a bonus; the top contributor will receive 500m ISK/article, second 375m ISK/article, and third 300m ISK/article. In the past we've given the top writer a fixed bonus reward, this new system increases the bonus the more that is written, and expands it to three potential winners instead of one. Contributors who achieve a spot among the top three writer positions for two months in a row are qualified to apply for junior editor positions, which can earn real-world financial incentives. I believe that only EVE Online articles are eligible for ISK payouts, so ask about payment before writing about any other game. Unless, of course, the goal is to become a junior editor and making real world cash. At that point, quantity counts as long as the quality doesn't drop. The TMC offer is a bit more appealing than the one from EN24. First, the requirements of two articles per month versus two per week is more attractive to those who may only have the spare time to write on weekends. Also, some stories just need a lot of research. Next is the presence of editors. If the TMC editorial staff takes steps like making sure links work properly (and are relevant) and stopping questionable stories as well as checking on grammar and spelling, that is a big plus in my view. Finally, TMC spells out the rewards for writing articles. One question I do have though is how well both news sites will do without real news until FozzieSov hits Tranquility in (hopefully) July. Reporting on Titan ganks only goes so far. Perhaps the current quiet in null sec will allow a shakedown period for new members of the staffs. But for those who wish to write about EVE, the openings are now available. Sometimes I wonder how to explain EVE Online to people. Instead of using words alone, I thought using some of CCP's excellent trailers might make the post more enjoyable. So here are four trailers along with a brief explanation of the points I wish to emphasize. 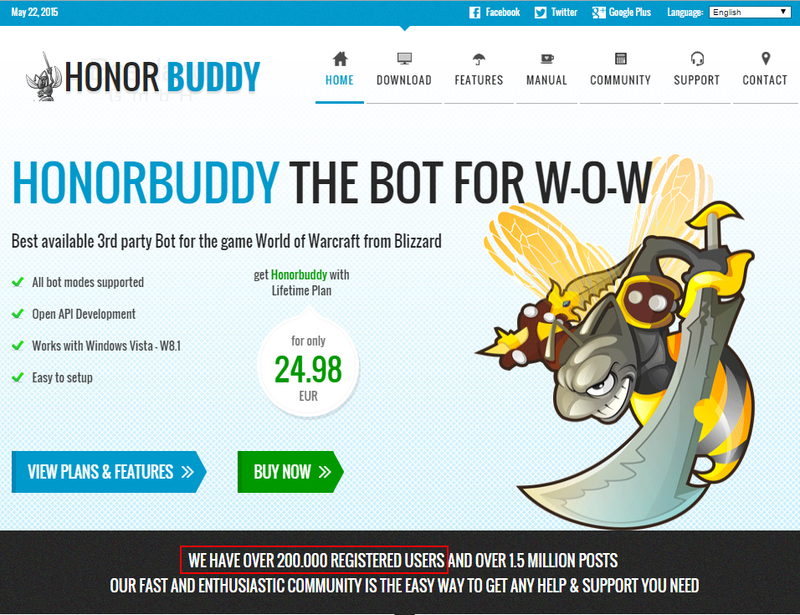 "We will soon release Honorbuddy again - we expect it to be by the end of this week. "Its been a week since we closed down the authentication servers for Honorbuddy. In this time, we tried to figure out what happened. We must say that we have no idea what really happened and all we have are speculations. "We speculate, that at some point, Blizzard used parts of the World of Warcraft client that acted in a hidden manner like malware. Then they scanned everything they could scan on a given computer and flagged the ones they thought were operating against their TOS/EULA. They are fine to install any such malware-type hidden software at any given time according to their End User Agreement. "There have been rumours, spread by Blizzard, that over 100,000 WOW Accounts have been banned during the ban wave on 13th May 2015 and that they are most likely all Honorbuddy users. We have to dispute this; there has never been that many active Honorbuddy users. We are still unaware if this was a real detection or some shady malware that was injected into everyones computer for a short period of time. "Be aware that we have not seen the cause of the bans. We have an anti-malware and anti-detection tool called Tripwire that aims to identify unexpected behaviour by gaming companies. We can just try to make sure, that the next time something shady has been done, that Tripwire detects it. Tripwire is the only hope we can rely on right now; it has been improved and hopefully will watch over your shoulder much better now. "Again, we will give no guarantee and we have never given a guarantee, that our software is immune to detection or bans." In effect, Blizzard went for a headshot in the RMT war ... and missed. The morale boosting effect of Bossland's legal victory over Blizzard in a Hamburg court two weeks ago had to help the bot maker whether the storm caused by the mass banning. Bossland is even using smack talk by Blizzard employees as a weapon to inoculate the bot maker from future claims by the game company. The Washington Post reported last Friday that the figure of 100,000 banned accounts came from a conversation between a player and a GM. Amazing how many news outlets went with the 100,000 accounts banned figure based on an image. Honorbuddy didn't have 200,000 active users? 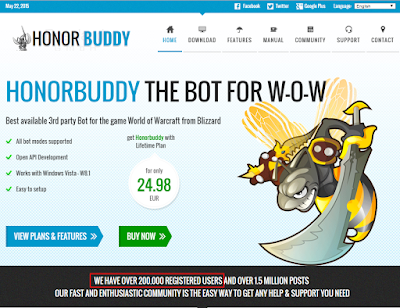 Of course, when Bossland made the statement, "there has never been that many [100,000] active Honorbuddy users," the spokesman hopes that readers ignore the front page of the site where Bossland claims over 200,000 registered users. So while Bossland survived the ban wave, the way the company is spinning like a top indicates the bot maker is heavily bruised. Now we see if Blizzard is committed to waging a CCP-style RMT war or if the gaming giant is too set in its ways to change its tactics. The company made a good start setting a cap on how much WoW gold sellers could charge with the WoW Token. 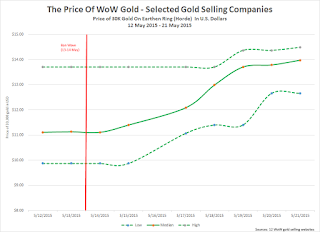 The "top down" pressure of gold sellers competing directly with Blizzard forced the median price of twelve sites I monitor down from $20.96 USD per 30,000 gold on 6 April down to $11.13 USD per 30,000 gold on the day the ban wave hit. The ban wave is a form of "bottom up" pressure that increases the operating costs of both the gold sellers and the independent gold farmers who sell to the various gold sellers. For example, the ban wave cut down on the supply of gold available for sale on the secondary (aka black) RMT market. The result is that sites that do not harvest their own product drive up the price of gold by competing with each other. 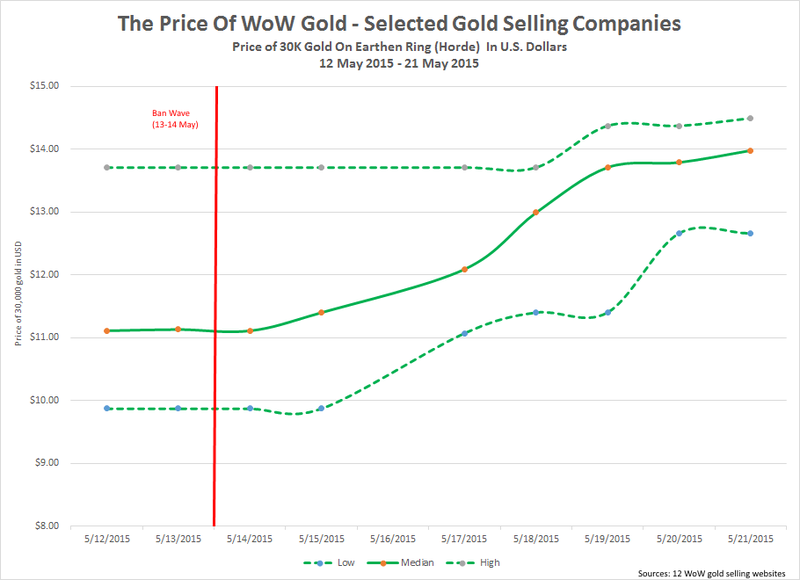 At least in North America, the secondary RMT market experienced a large spike in the price of WoW gold following the ban wave. The median price of my secondary RMT WoW gold price index rose from $11.11 per 30,000 gold on 14 May to $13.98 per 30,000. Perhaps more telling is that one of the gold sellers ran out of product to sell for four days. A 25.8% increase in the price of illicit WoW gold in seven days is a good start. Blizzard needs to keep the pressure on the botters who feed the gold selling websites. The higher the price of illicit gold, the more likely a player will choose to purchase their game's virtual currency through the game company. What holds true in New Eden also applies in Azeroth. But in order to keep the price up, Blizzard needs to end the practice of collecting lists of botters and conducting one or two major ban waves a year. That type of shock and awe tactic just gives botters months of uninterrupted time to operate. In order to have a real impact, Blizzard needs to holding ban waves at least once or twice a month, not once or twice a year. Ideally, Blizzard would move away from the concept of ban waves and ban bots based on their bot detection systems every day. Reading the Honorbuddy forums, a lot of users expressed dismay that Bossland would release the bot for use despite not knowing how Blizzard detected their bots in the most recent ban wave. But for the professional gold farmer, having accounts banned is just a normal cost of doing business. If a gold farmer receives $0.20/1000 gold, then selling 250,000 gold covers the box cost. A botter can easily cover the $50 cost of a copy of WoW every six months. Every two weeks though? If Blizzard takes action that often, I think a lot of the casual botters will either drift away or just stop botting. Some people wonder why I don't want to commit to writing only about EVE Online. Quite frankly, online gaming has a lot of cheating going on, and why would I want to limit myself to just the people that Team Security bans every day? The wider world offers up so many more opportunities for giggles than I could ever imagine. "I'll give you my perspective. So far we've unbanned 3 people out of 30k we've now banned. One of which is probably about to get re-banned for taking his video private. "I want to make sure it's clear there are consequences for cheating. You don't just get to make a video and get unbanned. This is a very limited time thing to try and raise awareness of what's actually going on. You may say "hey there clearly aren't consequences if you are unbanning people". Let's get back to the part where I said we've unbanned 3 people. If these videos go far and wide and it elevates the importance of getting rid of the cheaters in PC gaming, I feel it's an excellent trade. "Here's why. These guys could easily go right back in, make a new steam account.. use an HWID hack and play anyways. Yes, that's the reality. It's ugly, but there it is. And it's true for every single PC game out there. Even the ones that say it isn't. "So is this the right move? I don't know. But doing the same thing we have been doing is a tough fight and I'd like to at least try something different. "Video submissions end at Noon PST today anyways. Maybe by then it will be 4 or 5. We unbanned 5 out of 30k. Of course, someone on Reddit reminded Smedley of Daybreak's past views on the subject. "Today over half the pvp community that did not use their fingers to play have been banned. The other half were people who would use a program called T-Morph to do stupid things…Anyways we are demanding Blizzard to change their terms of service and fix this game so we can play again. WE do not want to see any lives lost due to A ban. "Blizzard you are ruining everything"
I only wish that GNC saved the categories the petition fell under. Another WoW-related petition on WhiteHouse.gov categorized a lag-free game experience as a civil and human right. While not a reporter, I do like to collect these types of stories. Hopefully you enjoyed these too. Does EVE Need A New Eden Gaming Commission? Another Council of Stellar Management election, another event involving a major gambling site in EVE Online. CSM 8 dealt with the discovery by players that CCP's rules for game time code resellers meant that player affiliates could avoid following some aspects of the EULA. CSM 9 faced the effects of SOMERblink attempting to circumvent the EULA and the subsequent banning of Somerset Mahm. Now, IWANTISK.com is in the news because CCP blacklisted the site in the IGB. While many suspect the involvement of illicit RMT in the decision, we don't know if ownership is involved, the matter involves just a few rogue employees, or if hackers cracked the website and CCP shut everything down, including banning accounts, until they can sort out the situation. Is EVE at the point where CCP needs to create something like the EVE Central Bank to oversee the gambling operations using virtual currency and virtual goods from the EVE universe? The EVE Central Bank isn't a permanent organization that meets every day deciding the fate of the New Eden economy. The EVE Central Bank meets whenever the economics team feels the movement of the PLEX market affects the ability of players to purchase PLEX to continue playing the game. The ECB is funded using the assets seized off of permanently banned accounts. Basically, the economics team sees strange movement in the PLEX market, meets with the senior producer, and if the senior producer agrees, the economics team dips into their stash of confiscated PLEX to steady the market. The CSM is informed of the move to ensure that no funny business (i.e. another T20 situation) occurs. If CCP does establish a New Eden Gaming Commission, the organization should only focus on violations of the EULA, Terms of Service, and any associated policies. If unscrupulous gaming operators want to cheat the rubes, let them. But if a gaming website becomes a way to launder large amounts of ISK for illicit RMT operations, CCP has to take action. And if a gambling site operator with a large amount of violations claims the nature of the business precludes taking any effective measures to prevent EULA/ToS violations, then perhaps CCP shouldn't provide the API access the operator needs in order to stay in business. Does CCP need to create a game commission if the company already has an internal group performing the same function? I'll answer with another question. Did Dr. Eyjo need to create an EVE Central Bank apart from an excuse to roleplay at work? Maybe. 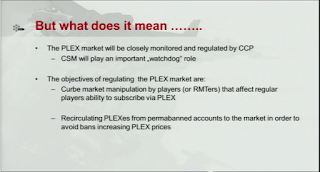 By giving the process for deciding to inject PLEX into the markets a name, he indicated that CCP recognized the important role that PLEX had gained in the EVE economy. He also identified the people making the decision as very highly placed individuals and not just a couple of guys looking at a spreadsheet. Finally, the term EVE Central Bank is a reminder that CCP does have a bank of seized PLEX and doesn't need to create PLEX out of thin air to influence the market. 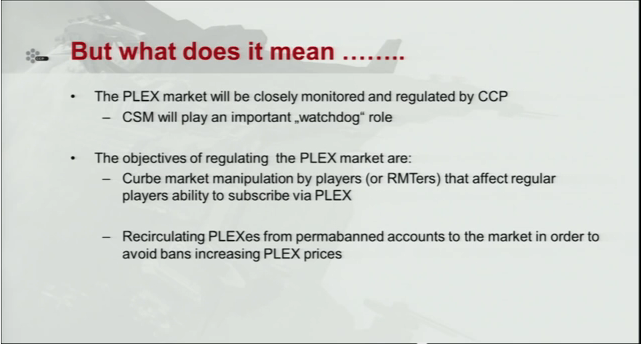 The PLEX, which CCP removed from the game due to player misconduct, is just reintroduced at a time when a major market manipulation CCP deems bad for the game occurs. I think the final answer on whether the company should introduce a new organization like a New Eden Gaming Commission into the game universe depends on how CCP views the current state of player-run gambling institutions. Do they feel that the gambling sites are prominent enough that they help distinguish EVE from other games on the market? Does CCP consider some of the websites large enough to partner with at EVE player gatherings? And are the gambling operations so big that their finances warrant special monitoring? If the answer to these three question is yes, then perhaps CCP may want to raise the visibility of its procedures for dealing with major player-run gambling sites. "No need for tinfoil - nothing sinister or strange afoot at CCP!" Over the weekend, TMC published an article by Dirk MacGirk publicizing the fact that CCP removed all financial documentation from its corporate website, probably following the delisting of its bonds on the NASDAQ Iceland exchange on 29 April. The fact that CCP intended to buy back the outstanding bonds was not a secret to observers in the EVE community. The marketsforISK blog covered the story on 5 April, speculating that CCP is undergoing a recapitalization process because its balance sheet is under pressure and the company needs new capital in order to continue. The news today is CCP is no longer required to publicly post any financial information. Every so often I visit the U.S. Patent and Trademark Office looking for new trademarks submitted by game companies. I found something interesting last night. CCP has abandoned all four of the trademarks it owned for EVE: Legion. CCP abandoned all trademarks on 13 April. 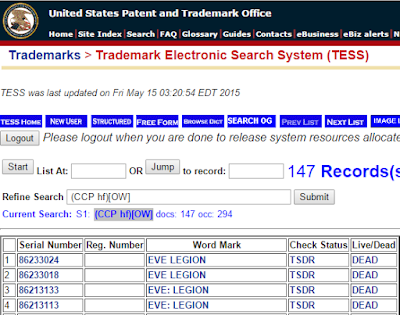 Not only do I no longer see any live trademarks filed with the U.S., containing the phrase "EVE Legion", but a search of the EU trademark databases also failed to find anything. Perhaps I need to cast a broader net. I hear that Blizzard files is remote trademark offices to avoid instant attention to its future plans. But with CCP abandoning all of the trademarks filed in the U.S., I have to ask the obvious questions. Is Project Legion dead and has CCP given up on the idea of bringing a first person shooter to the PC? EDIT: In response to the comments, I perhaps missed the most obvious question. Does CCP plan to port DUST 514 to the PC as DUST 514? If so, what a difference a year makes. EDIT 2: Biomassed pointed out that the EVE Legion is still trademarked with the World Intellectual Property Organization until 11 March 2024. The trademark received protection within the European Community on 6 March 2015. The gaming press is full of bad news for subscription MMORPGs lately. From an estimated 18% drop in subscriptions for EVE Online over the past two years to World of Warcraft losing 3 million subscriptions in the first quarter, 2015 is providing a lot of arguments against the subscription model. But no serious observer thinks that either game will shut down in 2015. Yesterday brought the first serious threat to the existence of a subscription game in 2015. NCSoft released its financial report for the first quarter and the figures look bleak for Wildstar. 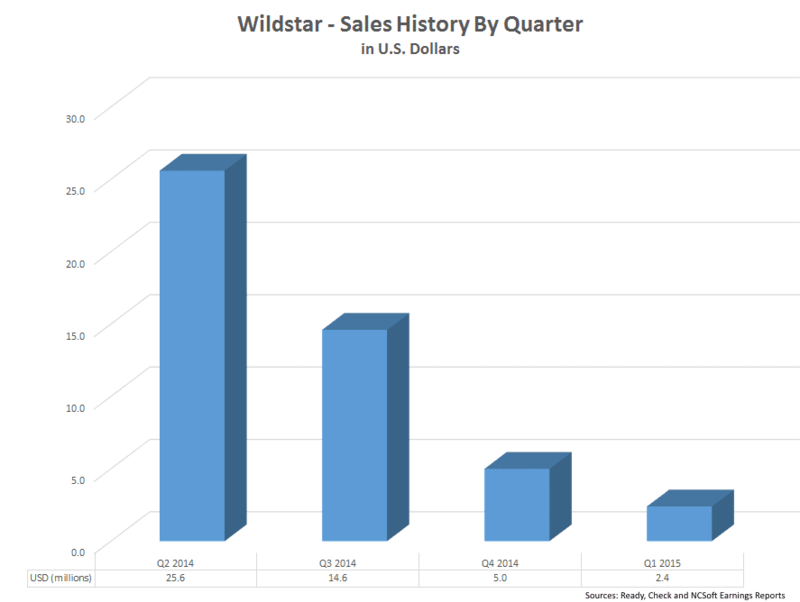 After using the currency converter at Bloomberg to convert Korean won to U.S. dollars, I found that Wildstar only made $2.4 million in sales during the first three months of 2015. Not good. Looking at the history of sales for Wildstar shows an even bleaker picture. How much did NCSoft invest into Carbine after purchasing the company in 2007? I don't know, but since Wildstar launched 6 1/2 years after the purchase, I figure the amount is closer to $100 million than the less than $50 million the game earned over the last year. Given the current health of the game, with only 4 shards still running (and 2 of those fairly deserted PvP worlds), I wonder if NCSoft will ever make back its investment in Wildstar's development. The big question is, will NCSoft decide to cut its losses and shut down the game. While many point to NCSoft's closure of City of Heroes, I look at the decision to close Tabula Rasa. According to NCSoft's Q2 2008 earnings statement, TR earned 2 billion KRW in the last full quarter before the announcement of the plan to close the game servers in February 2009. Wildstar earned 2.6 billion KRW in the first quarter this year. Tabula Rasa only lasted 15 months, showing that NCSoft is not afraid to cut its losses. When I looked at the state of Wildstar at the end of last year, I predicted that the game would not abandon the subscription model. I still don't. The process to convert a subscription game to either a free-to-play or buy-to-play game takes a lot of time and money. 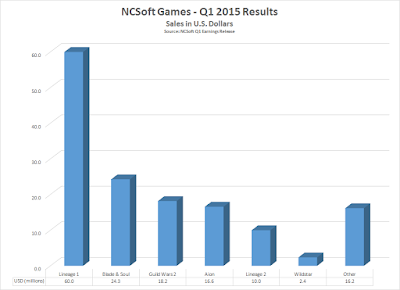 Unless Carbine is currently working on the conversion, I question whether NCSoft will cough up the cash. Why should they try to save Wildstar when Blade and Soul is performing so well? But without a revamp, I wonder how much time Wildstar has left. I don't spend much time in null sec, but writing about real money trading in EVE Online means I have to keep an eye on that area of New Eden. One of the worst kept secrets is the prevalence of botters and associated illicit activity associated with the null sec rental alliances. In Team Security's Fanfest presentation, they revealed that the three alliances receiving the most bans are all well-known rental alliances. One of the benefits of blogging is practicing and improving my writing skills. Practice makes perfect, right? On the flip side, imperfect practice does not help and ingrains bad habits. So how do I avoid that trap since I do not have an editor to review my posts before pushing the publish button? The Rise Of The Black Ops? I usually don't write about null sec warfare because about the only time I spend in null is when I pop out of a Thera wormhole as I'm entering it into Tripwire. However, I do like cloaky ships. With those two conflicting impulses at work, I'll demonstrate why I'm a carebear. When I first looked at the new sovereignty mechanics, I didn't think of the trollceptor. I thought about the mechanics as if two medium to large sized player entities were engaged in a conflict over a constellation. That's right, a constellation. With control of a system or a station determined by fighting throughout a constellation, I figure that the natural theater of operations is the constellation. If an alliance really wants a station, does it make any sense to let the opposition control the other 5-7 systems in the constellation? I don't think so, but then again, my only experience with system control is watching the Amarr and Minmatar fight for control of the war zone. I figure that in the new normal coming in June, stargate control within constellations will prove key to controlling sovereignty and winning sov fights, at least in the early days. If I can think of bubbling all the gates, so will others. The next step in the evolution of combat is how to negate the impact of the warp disruption bubble. If the forces are large enough, they can fight for physical control of the stargates. But what about the side losing the gate fights? If the objective is important enough, they will want to keep fighting. The obvious first answer is the use of interdiction immune ships like interceptors and strategic cruisers. I say obvious because the first thing everyone thought of was the trollceptor, partially because of its immunity. But I've always gotten the impression that strategic cruiser fleets are good at support and kiting. Would such a fleet be a good first choice for attacking a defended point in space? Remember, using the entosis link means the ship has to stay in range of the objective, can't receive remote reps (or assists of any kind), and can't warp away for two minutes (assuming the use of a tech 2 module). When I envision a big constellation battle, I'd expect to see the attacking force putting up POS in the the first system targeted for takeover. Not only does that give the attacking force safe places to refit and repair, but also serve as a point to launch ships into other systems in the constellation. That's right, I'm thinking of an attacking force using cynos to bridge heavy forces past the defender's gate camps. I know, I know, one side can just post large forces in each constellation and crush the defender. But I'm thinking of more fluid situations where losses may make such a strategy untenable. Besides, ever hear the term defeat in detail? If a good sized war is happening, the attacker may try to get the defender to commit to such a strategy and then slowly whittle away at the defender in a war of attrition. Given a situation in which an attacker with supercapital superiority initiates a constellation invasion and succeeds in reinforcing a station or iHub, I'd expect the defender to put up cynosural system jammers. Sure, the attacker can still jump through gates with an unstoppable apex force, but that force can only influence one system and one capture point at a time. More importantly, that force is slow. Very slow. I get the impression that control fights will require quickness and maneuverability. What isn't slow is a black ops group. I imagine that in the new sov capture system, a black ops group will prove quite effective. Cynosural system jammers don't affect covert cynos so the group can jump past gate camps. I also have to imagine that a tech 3 fleet with bomber support is a much scarier proposition than a tech 3 fleet by itself. Add in the ability to interfere with the enemy's entosis links with Falcons (jamming) and Arazus (sensor dampening) and I think a well-run black ops group can cause the opposition some serious problems. And if the enemy is large enough to stop the black ops group and doesn't have the protection of cyno jammers? That's where a reserve force sitting on a titan comes in handy. Of course, the enemy may want the reserve force deployed because they have their own plans. The enemy doesn't always sit around passively waiting to get stomped. That's why they're called the enemy. As I mentioned before, I'm a carebear. What I just outlined is possibly entirely wrong and the null sec entities will just bash into one another in big set piece battles like they did under Dominion sov. But somehow, I don't think that will happen. If I'm even partially right, I see the use of the black ops battleship becoming more important in sov warfare come June. Okay, so I'm an evil person. Sue me. Yesterday I drove up to Madison and attended the meetup that The Mittani and Sion Kumitomo hold on the first Tuesday of every month at the Come Back Inn. The meetup isn't a full-blown Goon/Imperium event, just a nice little get together that filled up a large table. Don't ask about EVE names because everyone used real names. Oh, and I didn't catch the name of the chihuahua that was snuggled underneath the wormholers hoody. Sorry! One of the themes running though the night is how to keep players interested and having fun in EVE. In that sense, The Mittani isn't too much different from the someone running a 30-man corporation. He just has to provide content for thousands of players. And he has a talented staff to run things and help bring the vision to life. Okay, so not exactly like the CEO of a 30-man corp.
Now, sometimes the members of your corp/guild/clan want to do things that leadership thinks is old, and that is what The Mittani was facing. Another Burn Jita? That's where my big mouth came in. I asked why not just do a Burn Amarr, since The Imperium planned on role playing in Providence with CVA anyway. Shortly after came this tweet. Seriously, no one had thought of doing this? Probably some Minmatar role players, but who has the kind of resources needed to do a Burn Amarr? Stupid question. The guy at the table wearing the red shirt. I'm not going to go into all the details I heard, because anything I heard was just spitballing, but the people at the table have some crazy imaginations. I'm sure that some of the crazier ideas will drop off the radar screen. Others may (and probably will) mutate into ways no one anticipates. I will say that I know some of the thinking now and I can't wait to see what happens. One of the benefits of playing EVE Online is the opportunity to watch the antics of the community up close and get the subtleties that outsides will miss. Whether it's Pandemic Legion hiding its love of k-pop in the shadow of Taylor Swift fanboi Elise Randolph or the trials and tribulations of Brave Newbies or the community's love affair with hats, I've never lacked for storylines to follow. But since I started playing in 2009, perhaps the longest running storyline is the Goons/CFC/The Imperium. In that time, the most prominent Goon of all is The Mittani, although that's probably because Mr. Vee keeps leaving his Curor in NOL-9M and Goons keep having to invade Delve to get his ship back. Back in 2009 and before, one way to get hired by a game company was to become a prominent games journalist or a well-known guild leader. But, starting in 2010 with his talk at GDC I didn't believe that just working for a game company was The Mittani's end goal. That belief was reinforced in 2011 with the emergency CSM summit held in the wake of the disastrous launch of Incarna and all the associated issues brought about with the introduction of a cash shop. The Mittani broke into the gaming news again as the chairman of CSM 6 and became, if not already, a media figure. Not bad for a mere player in a game. Since then, I've watched both the actions of The Mittani and the CFC, er, The Imperium waiting for them to do unique things in the gaming sphere. The launch of TMC in 2012 signaled that, unlike what many believed, The Mittani was not out to destroy EVE. In fact, the existence of TMC now means that The Mittani is now invested in the success of EVE, as the game is the base of his fame as well as the centerpiece of an out-of-game enterprise. What happened this weekend, with The Imperium launching an invasion into H1Z1, was bound to happen one day. Game companies cannot produce content faster than players can consume it. That's not such a problem for sandbox games, but players still like things like live events. But live events take planning, setup, and resources. CCP, with only one server, usually only has the resources to conduct live events in the EU time zone. Now, imagine trying to conduct live events across multiple shards. No company, not even Blizzard, is going to pull off that trick. What if a game company can convince a large group to come into a game and hit multiple shards? That solves a problem, doesn't it? But you can't have a group of goody-goodies come in. The purpose is to have the existing community rally against the invading evil. But what group large enough to matter would not mind about having such a reputation? Also, who can a company find to inspire such feelings that would have a community rally against? The Mittani makes a pretty good bad guy, doesn't he? Okay, so The Imperium is a natural OPFOR (opposing force) to bring into a sandbox PvP game. Daybreak Games is a natural choice of game developer, as the ties between The Imperium and Daybreak are pretty close, going back to Smed's days flying with the CFC (as part of TEST?). And with H1Z1 still in a paid alpha, not only could the game use a little publicity but some server stress testing as well. I will say I was surprised at how organized the effort is. Not the player organization displayed on the Twitch stream, that's a given. I'm referring to the item givaways. In addition to the cosmetic item pack, TMC gave away an ASUS ROG G751JL gaming laptop (the drawing conducted by Daybreak). For the TMC Twitch stream, Nvidia donated 5 Nvidia Shield Portables and 12 backpacks to give away to subscribers of the Twitch channel. What The Imperium brings new to the table isn't a single guild playing multiple games. Many, many guilds have done that for years. The same holds true for establishing communities in multiple MMORPGs. No, what The Imperium brings is a group of players willing to go into games and serve as the opposing force in a live event. I haven't heard of that occurring before. And that is why I play and follow EVE. Fascinating things occur, and I'm interested in how this one turns out. On Tuesday CCP introduced ship skins into EVE Online's cash shop. Some people were upset over the implementation of the feature, especially after the bug that allowed players to put skins on any of their ships. The cost of the skins is also an issue for many. Since I don't really know much about the pricing of virtual goods like skins, I decided to download League of Legends and take a look at the pricing structure in Riot's cash shop. 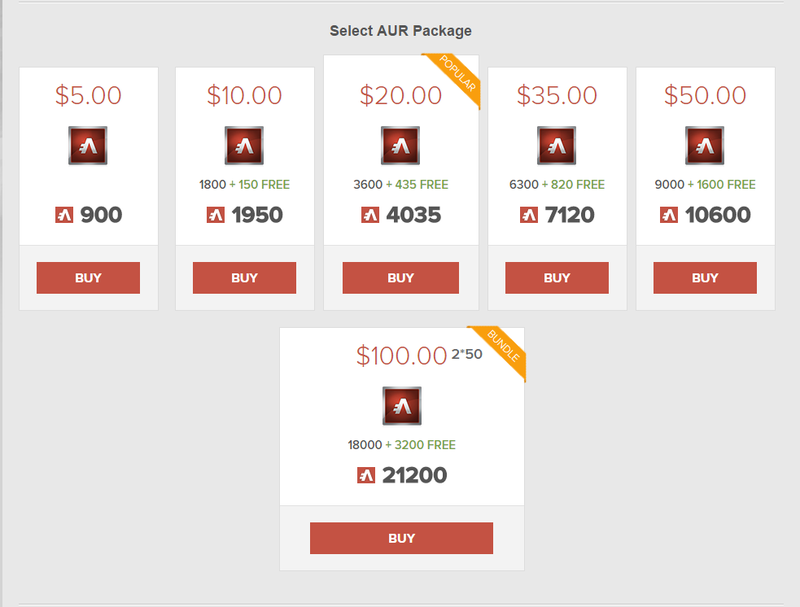 First, CCP changed the price structure on their Aurum packages. The $15 option was removed, the $5 and $10 buffed, and the amount of Aurum for $20 declined. But how does the new price structure compare to the cash shop in LoL? Notice that CCP now has the same price points as Riot. Perhaps more importantly, the amount of cash shop cash offered rises approximately at the same rates also. 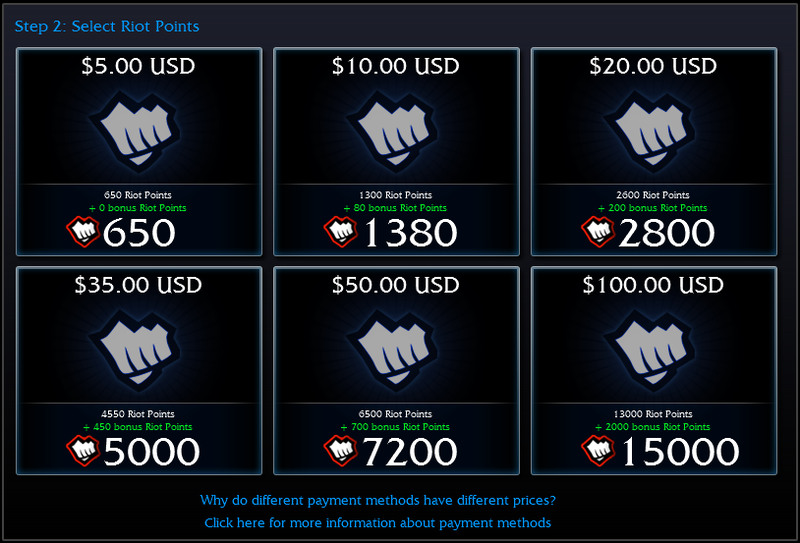 In League of Legends, the amount of Riot Points increases 4.3 times from the $5 package to the $20 package. CCP is slightly more generous, with an increase of 4.5 times between the two price points. As an aside, I noticed the $35 package for LoL is an even 5000 RP. A $35 price point is interesting as that is the standard price point for purchasing 2 PLEX for EVE. So basically, 5000 Riot Points is the equivalent of 1.6-1.7 billion ISK in EVE. But what about the important part? The piece I was really interested in is how much are ship skins in EVE compared with League of Legends. Prices in EVE, as many probably already suspected, are higher in EVE. How much? In EVE, prices range from $3.67 USD for the cheapest frigate skin to $32.64 USD for the most expensive titan and supercarrier skins. Contrast that with LoL, in which prices range from $2.78 - $23.21 USD. Perhaps the most worrisome comparison is the median price. EVE's median price for a ship skin, at $11.85, is almost a full $5 higher than the median price of $6.96 for a LoL character skin. Of course, just comparing EVE's ship skins to LoL's character skins is a bit unfair. For League players who wish to fully customize the look of their characters, ward skins are also available. Ward skins change the appearance of stealth and vision wards in the game. Each ward skin is 640 RP, or $4.57. However, ward skins are not bound to single champions, so I'm not sure exactly how to calculate the full cost of customizing a champion's appearance. A secondary question I had when I looked at the price list was why so many skins that fit on the same ship had different price values. For example, the Rifter's Nefantar skin, at 1540 Aurum, is more than twice as expensive as the Rifter's Krusual skin (740 AUR). But apparently that's just a product of demand. Different prices for skins on the same champion is a frequent practice for Riot. Miss Fortune apparently is one of the more popular champions with 5 character skins. The prices range from $3.71 to $9.64, with fans of the champion needing to pay $32.64 for the entire set of skins. I should add one important fact. We don't know all of CCP's plans for the cash shop and skins. For example, how often does CCP plan to release new skins? How often will CCP have sales, and how long will the sales last? And how annoying will the ads letting us know about the sales get? League of Legends and other free-to-play games that rely on cash shops just don't put products in the cash shop and forget about them. I don't expect CCP to do so either. But, I will say one thing. I do think the skins are a bit overpriced. I'm sure that Amarr loyalists will argue that the navy has improved dramatically since the Battle of Vak'Atioth. One of the reasons for watching these videos is to pick up clues for changes in the game not mentioned in the patch notes. The big one in this video is that using an entosis link on Jove Observatories can lead to getting valuable loot. One caution, however. I'm pretty sure doing so will draw the attention of the Circadian Seekers and Drifter battleships. We also learned more about the back story of the entosis link. The Scope report is reporting that some believe the Carthum Conglomerate's decision to market the entosis link as the cause of the escalation of tensions with the Drifters. However, information gleamed by those using the entosis link have uncovered proof that the Jove observatories have operated for decades observing activity in New Eden. But were tensions bound to escalate once the cloaking devices on the Jove observatories began to fail? I should add one interesting fact before concluding this section. The biggest stockholder in the Carthum Conglomerate is the Sarum family. That's right, the family of Empress Jamyl I. Are we seeing a bit of corruption in the Empire? Or is something a bit more ominous happening? For those not keeping track, the Sarum family is the only one of the Amarrian royal families who still believes in The Reclaiming, the term used for the Amarr Empire's methodical conquest and enslavement of other races throughout New Eden. Surprisingly, upon her ascension to the throne, Empress Jamyl I did not renew the policy. I can't help but wonder if this is a sneaky way to bring The Reclaiming back to the fore of Amarrian religious and foreign policies. Northern Associates lose sovereignty in systems across Insmother, Feythabolis, Oasa, and Period Basis. Lai Dai corporation denies rumors of involvement in raid on Propel Dynamics warehouse in Tamo. Increased Drifter presence in Amarr territory places Federation Navy tripwire forces in standby in Solitude and Sinq Laison. Sanmatar Shakor declines to comment on capsuleer request for further information on Lakat-Hro caravan, citing concerns for Republic security. Villore Accords blockade fails to prevent trade and passage in Okkamon as Caldari Navy are sighted in continued final testing of Jackdaw prototype. Capsuleers begin to collect snippets of data salvaged from Jove observatories with entosis link. Capsuleers continue to press for removal of slaves from SCC market listing. 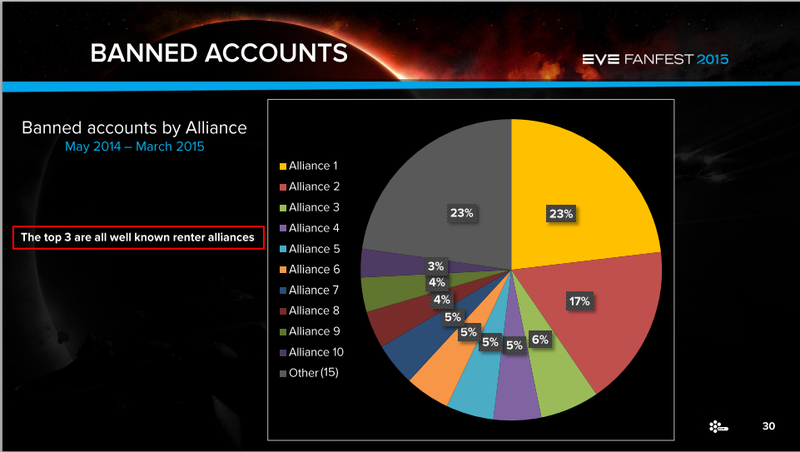 Northern Associates is one of the biggest rental alliances in EVE. NA losing so many systems is another indication of the changes that the new sovereignty capture system will bring to New Eden on 2 June. The mention of the Lai Dai corporation is interesting. The Lai Dai is a Caldari mega corporation that helped form the Carthum Conglomerate. Coincidence? Or is the leadership of the Lai Dai trying to save face by stating they don't need to cheat to outperform their Ishukone competition? Is the Federation Navy going on alert just prudence since the CONCORD-owned constellation of Sanctum (of which Yulai is a part) adjoins the Gallene regions of Essence, Everyshore, Sinq Laison, and Verge Vendor? Or is this more foreshadowing that the Gallente are the Drifters' next target. If the Sisters of EVE are somehow involved, then the Gallente are probably a good guess. The Sanmatar Shakor story is in reference to a post on the official EVE forums by Rhavas asking about one of the great Thukker caravans that was lost in the aftermath of the Seyllin Incident. Given that the wreck of the caravan's Hel is in Thera, I'm kind of interested myself. Villore Accords is a player alliance that participates in factional warfare for the Gallente. I also understand they do a little role playing, so the desire to prevent the Caldari from finishing the new Jackdaw tech 3 destroyer makes perfect sense. Especially since the Gallente don't have one yet. Another reminder in the scroll that the Jove observatories are dropping loot. Is this a hint that the loot is valuable and important to how CCP wants to develop the game? More from the forums, as a petition is formed asking for the removal of slaves from New Eden's markets. Finally, the news scroll ended with "Empress Jamyl I atten". Really? The empress finally makes a public appearance and the story gets cut off. What a tease!